The eques gladiators were a unique class who would start their battle on horseback, hence the name eques which is both singular and Latin, and actually means ‘knight’. The gladiators were named after the the plural name Equites who were part of the aristocratic classes in ancient Rome and were members of the equestrian order, which itself comes from a Latin word meaning ‘horseman.’ It is this history in Rome where the eques gladiators are born, and were brought to life in the Colosseum. 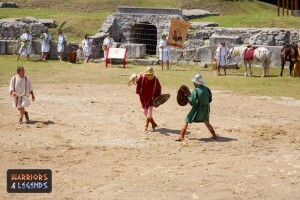 Due to the unique nature of a gladiatorial battle involving horses, the eques only faced other eques gladiators, thus making it a fair fight. The battle between these two warriors typically started on horseback before the gladiators dismounted from their steeds and proceeded to finish the battle on foot. In this way the eques battle was definately something of a spectacle for the crowds in ancient Rome. Equipped with fairly standard weapons, the eques were armed with two different types of weapons. Firstly they had a longer range spear for use while in the first portion of the contest on horseback. 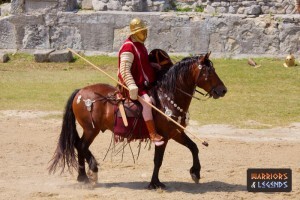 Secondly they also carried a gladius which they would use once they dismounted their horses. In both stages of the battle the eques would make use of a small rounded shield that would offer them protection from the spear while mounted, and could be used to deflect the sword attacks of their foes in close quarters. An eques gladiator enters the ampitheatre, calm and ready for the battle to begin. The eques were very lightly armoured with only a helmet for protection. It’s thought the helmet was shaped with a round top, with a wide brim and a small slit for the eyes. For decoration the helmet was topped with two feathers, that were purely for aesthetic reasons. The legs of the eques were also wrapped rather that wearing greaves, probably because of their need to use the legs when controlling their horses. Finally the eques had their shield, which was a small round Parma shield, much smaller than the larger scutum shield but perfect for the eques when on horseback due to its weight. 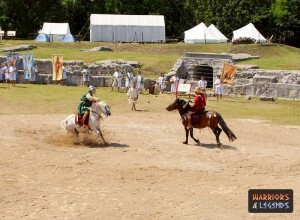 The start of the battle begins with both of the two eques gladiators on horseback. The eques had to use two completely different styles of fighting, but luckily for them, their foe had the same to content with. On horseback the eques would use their spear to try and lance their opponent, simultaneously using their shield and horseman ship to avoid their opponents attacks. The level of horsemanship and even their steed would play a huge factor in how well this portion of the battle would go for the eques. One these warriors dismounted they would have to move to short range combat on the feet. Using their shield and gladius swords the eques would battle in a much more formal manner, with skill and speed playing a big factor due to their lightweight clothing and minimal armour. The eques gladiators now battle on foot. The eques gladiators were something of a spectacle, not saying that the rest of the gladiators were not, but entering the arena on horseback was an extravagant entrance. As the battle continued these gladiators would continue to put on a show until the fight moved to the feet, entering more traditional gladiatorial style.